Three key initiatives putting new life into our connection to each other. 1. Initiatives— specific areas of focus such as conflict management, leadership, and personal development. Tracks — specific areas of focus within initiatives such as conflict management, leadership, and personal development. 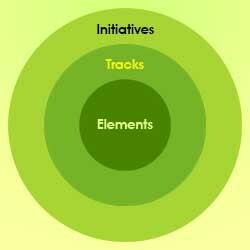 Elements — specific delivery components within tracks such as courses, information, advisory services, and multimedia. At the heart of our initiatives is our drive to suport the expansion of cultures of compassion, increasing healthy power (e.g., justice, understanding, joy, well-being)for all life, and the restoration of life lost to the plagues of hate, fear, greed, injury, loss, ignorance, and other forms that produce suffering. We are committed to making a significant, tangible, and measurable contribution to the quality of all life. The Organizational CPR Global Initiative is directed toward a broad range of organizations and includes government, business, healthcare systems, service agencies, colleges and universities, schools, faith groups, and other organizations worldwide. The Community CPR Global Initiative is directed toward communities and the unique challenges each presents. By "communities," we mean geographic communities such as urban areas, districts, and neighbors as well as communities of people organized by interests, professions, positive movements (including other compassion efforts), etc. Since organizations and communities are made up of people, we've created the Personal CPR Global Initiative for individuals and small groups to assist them in developing their compassion skills, healthy power, and ability to restore those parts of their lives that have been lost to sorrow and suffering.